Special commemoration is made of the Patriarch Abraham, to whom the promise was first given, when God said to him, "By your seed shall all the nations of the earth be blessed" (Gen. 22:18). This promise was given some two thousand years before Christ, when Abraham was seventy-five years of age. God called him and commanded him to forsake his country, parents, and kinsmen, and to depart to the land of the Canaanites. When he arrived there, God told him, "I will give this land to your seed" (Gen. 12:7); for this cause, that land was called the "Promised Land," which later became the country of the Hebrew people, and which is also called Palestine by the historians. There, after the passage of twenty-four years, Abraham received God's law concerning circumcision. In the one hundredth year of his life, when Sarah was in her ninetieth year, they became the parents of Isaac. Having lived 175 years altogether, he reposed in peace, a venerable elder full of days. You justified the Forefathers by faith, and through them betrothed yourself, aforetime, to the Church taken from out of the Gentiles. The saints boast in glory, for from their seed, there exists a noble crop, who is she who without seed has given You birth. By their intercessions, O Christ our God, save our souls. You did not worship the graven image, O thrice-blessed ones, but armed with the immaterial Essence of God, you were glorified in a trial by fire. From the midst of unbearable flames you called on God, crying: Hasten, O compassionate One! Speedily come to our aid, for You are merciful and able to do as You will. The Sunday of the Holy Forefathers occurs between the 11th and the 17th of December. 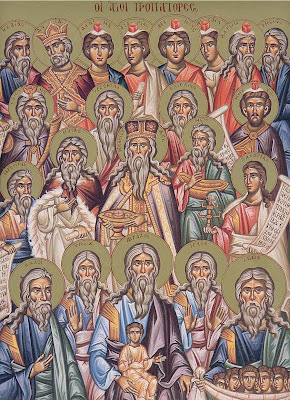 This Sunday commemorates all the ancestors of the people of God, the holy patriarchs living up to the law, given on Sinai, and under the law, - from Adam to Joseph the Betrothed; together with them are commemorated "those who preached Christ" the holy prophets - from Samuel to Zechariah and to John the Baptist, and all the Old Testament righteous men, who were righteous in the faith in the coming of the Messiah. Especially in the service for this day are praised "the pious youths" Ananias, Azarias, and Misael, who "in faith were thrown into the fiery furnace" and "who in the middle of the flames were cooled by the dew of the Spirit and who walked about rejoicing, are mystically a prototype of the Trinity and the incarnation of Christ" from the Virgin, who after giving birth remained a virgin. 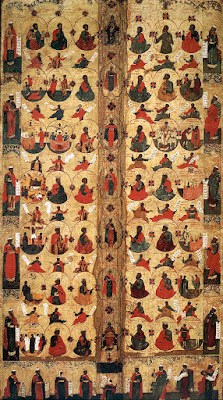 With these holy youths are commemorated also “the righteous Daniel and the wonderful prophets”, who, clearly revealing the divine second coming, saw Christ, “coming to all nations as Judge”, and who, “your mind illumined by divine radiance”, "that clearly the Virgin would give birth represented in mystical images". 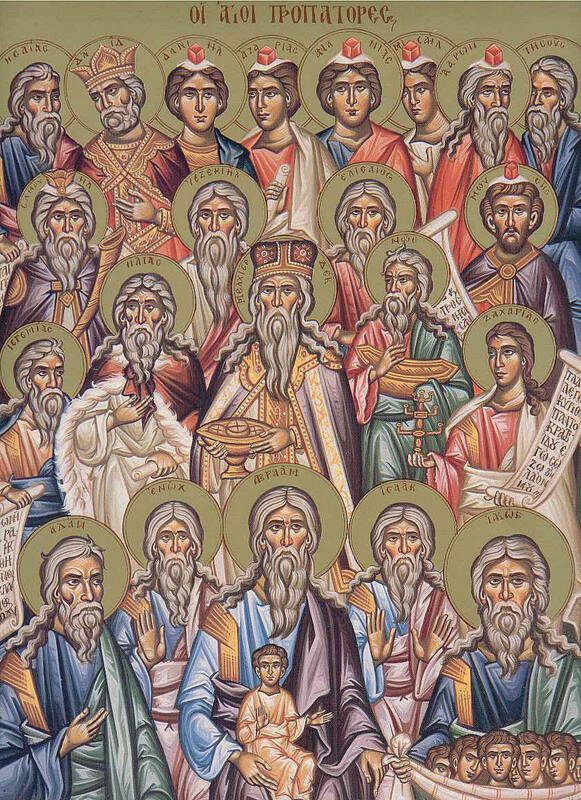 "Today as we celebrate the Forefathers’ memory”, the holy Church exclaims: “let us offer praise to the fathers, who shone forth before and during the law, with righteous minds they served the Lord and Master who shone forth from the Virgin, now they delight in the unending light.” "Let us offer songs of praise to the prophets of God". "Let us honor the holy youths, for they quenched the flaming furnace, together with the prophet Daniel, and all the righteous ones who shone forth before the law, together with those who served the Master under the law.” By accomplishing “now the honor of the memory of the forefathers”, the holy Church edifies us, that we, in the expectation of the great and light-bearing day of the Nativity of Christ, is reflected by the faith and life of the holy Forefathers and, through them, has prepared ourselves, by their example, to the worthy meeting of the Lord Who came from Heaven, who has adorned their soul with virtues beforehand to be ready for the great and light-bearing day of the Nativity of our Savior worthily to meet Him with the lamp of faith and with the oil of charitable deeds, with the firm hope of life everlasting, with the light of both the joyful face of cleanliness and purity. Together with them the holy Church on the present day, that its appeal be not in vain, places in the Gospel reading by the clergy about those called in Vespers, inspiring us, that we can be distracted from worthily meeting the Lord by the predominance of flesh over spirit, the attachment to the terrestrial, the blinding by gleam of worldly goods, the predilection for vanity, the unwillingness to deny one’s self-love and pride everyday, the enslavement to passions and covetousness, and in the Epistle reading directly commands us to destroy our earthly members: fornication, impurity, passion, evil lust and cupidity, to lay aside anger, evil, blaspheming, slander, lies, and in general to take off the old man and put on the new in the image of the Creator (Col. 3:4-11). In the sacred chants for this day among the Old Testament righteous men the following are referred to by name: Aaron (the first priest, brother of Moses), Avakum [LXX for Habakkuk] (see December 2), Obadiah (see November 19), Abel (son of Adam), Abraham (see October 9), Haggai (see December 16), Adam (Forefather of the human race), Azariah (see December 17), Anna (see December 9), Barak (see. Judges 4-5), Gideon (see September 26), David (see December 26), Daniel (see December 17), Deborah (see Judges 4-5), Eleazar (see September 2), Elisha (see June 14), Enos (son of Seth, - see Genesis 5:6-11), Enoch (see Gen 5: 18-24), Esther (see Esther 1-10), Zechariah (see February 8), Elijah (see July 20), Isaac(son of Abraham), Isaiah (see May 9), Jael (see. Judges 4-5), Jacob (son of Isaac), Ezekiel (see July 21), Jeremiah (see May 1), Jesse (father of David), Jephthah (see Judges 11, 12:1-7), Joshua (see September 1), Job (see May 6), Jonah (see September 22), Joseph (see March 31), Josiah (see 4 Kings, 21:26, 22, 23:1-30), Judah (see. Gen 49:8-17), Judith (see book of Judith 1- 16), Levi (son of Jacob), Malachi (see January 3), Melchizedek (see. Gen 14:18-20), Misael (see December 17), Micaiah (see August 14), Moses (see September 4), Nahum (see December 1), Nathan (see 2 Kings 5:14), Noah (see. Gen 5:28-32, 6-9), Huldah (see April 10, 4 Kings 22:14), Hur (see Exodus 24:14), Rachel (wife of Jacob), Rebecca (wife of Isaac), Ruth (see Ruth 1-4), Samson (see Judges 13-16), Samuel (see August 20), Sarah (wife of Abraham), Seth (son of Adam, see. Gen 5:3-5), Solomon (son of David), Zephaniah (see December 3). Singing in the service for this day “the god-pleasing life” of the Old Testament righteous men, the Holy Church thus represents our intellectual look at the whole universe of great virtues, such as: the God-loving gentleness and meekness of the first martyr in the world, Abel, the holy zeal for the glorification of the name of God, Enos, the high divine thinking and the fear of God, Enoch, the firmness in faith and piety, Noah among the general depravity of his contemporary world, the wonderful faith and obedience to the word of God, Abraham, filial obedience, Isaac up to the preparation to be offered as a burnt offering according to the command of God, the kind domestic bravery, Sarah, the penetrating maternal love, Rebecca, the mild humility, Jacob who earned the rage of Laban and Esau, the holy chastity, Joseph who was more than ready to suffer and die, rather than to sin before God, the unhampered invincible patience in the sufferings and misfortunes, Job, the meek, wise leadership, Moses and Samuel, the inspiring courage through faith, Joshua son of Nun, Barak, and Gideon, the high self-sacrificing love for their country and people, Judith and Esther, the plaintive and contrite repentance, David and Manasseh, the ascetic and divinely intellectual life, Elijah and Elisha, the zeal for the glory of God of the holy prophets, the unhampered invincible dedication to the law of God and usual patriotism of the three youths in Babylon and the rest of the good deeds of all the other Old Testament men we celebrate, "of whom the world was not worthy" (Hebrews 11:38). 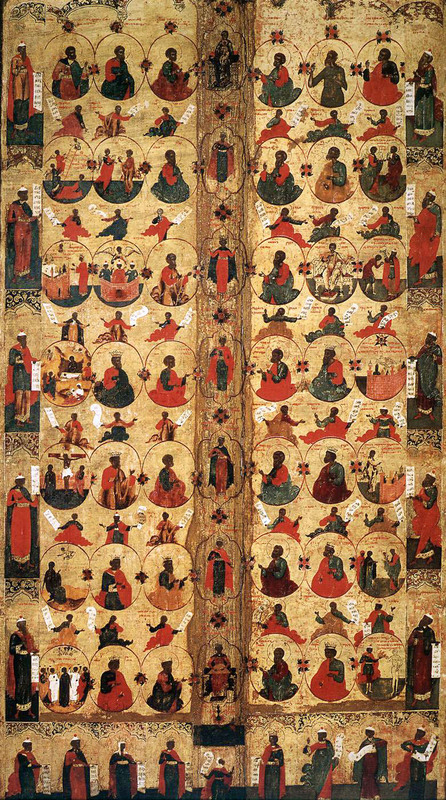 According to the teaching of St. Gregory the Theologian, each of these virtues stand by themselves «as a special way to salvation, and undoubtedly results in any one of the everlasting and blessed abodes; for as the generations of life are various, so are the abodes of God are many (John 14:2), and in them are divided and are assigned to everyone according to his worthiness. Therefore let one fulfill his virtue, one to another, the other of the many, and whoever, if it is possible, and in everything; only let everyone go without stopping, let everyone strive forward and follow steadily in the steps of the good leaders, who directly leads a path for him, and makes his way through the narrow gate (Matthew 7:14) to lead to the heights of the blessed heaven». When the Nativity falls on Sunday, - Sun. of the Holy Forefathers 11, and the Holy Fathers 18 December. When the Nativity falls on Monday -Sun of the Holy Forefathers 17, and the Holy Fathers 24 December. When the Nativity falls on Tuesday, - Sun. of the Holy Forefathers 16, and the Holy Fathers 23 December. When the Nativity falls on Wednesday, - Sun. of the Holy Forefathers 15, and the Holy Fathers 22 December. When the Nativity falls on Thursday, - Sun. of the Holy Forefathers 14, and the Holy Fathers 21 December. When the Nativity falls on Friday, - Sun. of the Holy Forefathers 13, and the Holy Fathers 20 December. When the Nativity falls on Saturday, - Sun. of the Holy Forefathers 12, and the Holy Fathers 19 December.